Sunny Day in Paradise is complete. It measures 6-1/2 by 19 inches, is entirely handstitched, and all the fabric is handmade except the commercial border fabric. I really enjoyed making this piece and I'm happy with the way it turned out. I learn something new -- or test out new techniques -- with each piece I make. 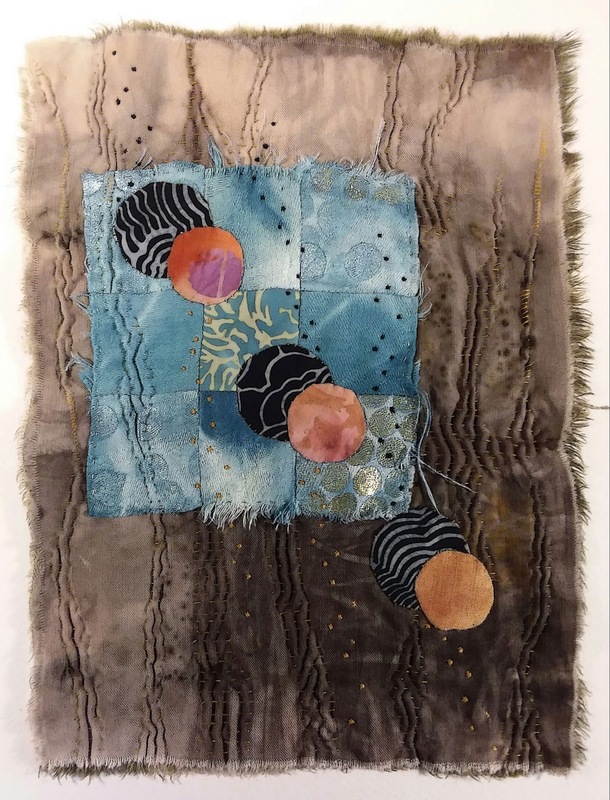 This piece and Hunter's Moon gave me the opportunity to try out running stitch, aka Kantha stitch, those areas where the stitches pucker the fabric to create interesting waves. This is the same stitch one uses to create mokume gane, the shibori technique. 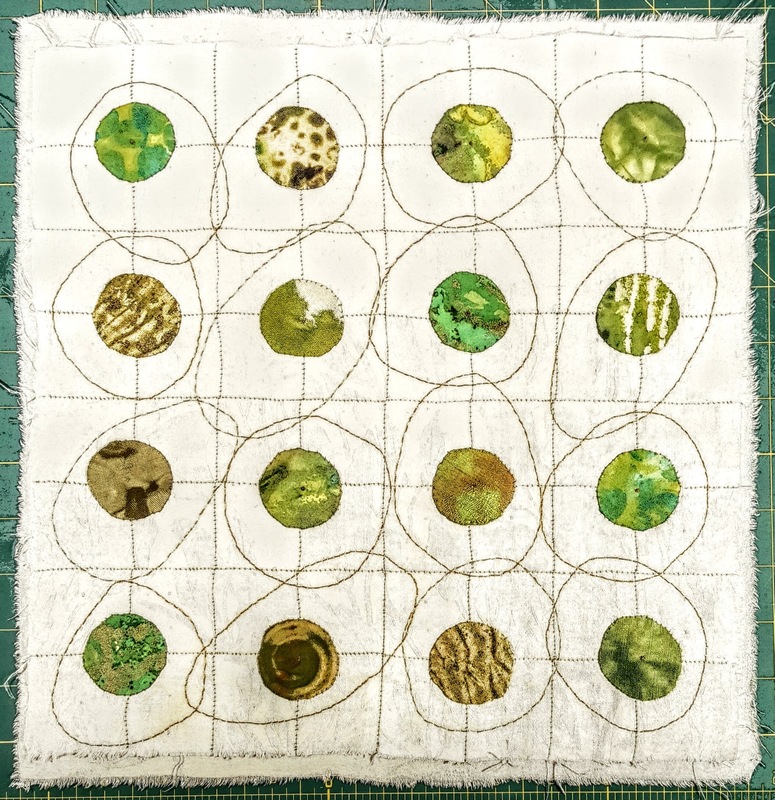 You essentially do the same thing as I've done in these pieces, only usually on a larger piece over a more extended area, then dye or discharge the stitched up fabric. 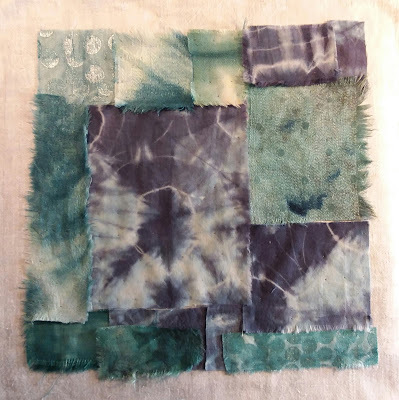 That was one of my favorite shibori techniques when I was dyeing, so I'm glad to be doing it again now with stitching only. Contrary to the name of the piece, it's raining heavily as I write this. It's such a treat to have real rain, especially this early in the season. I've been cooking and baking a lot lately, and my freezer is full of goodies for the coming months. You'll likely not hear from me before Hallowe'en, so have a safe and fun one. I think Hallowe'en has eclipsed Christmas as the biggest decoration, and certainly dress-up, event of the year. This is the piece I'm currently working on for another SunMoonStars project. 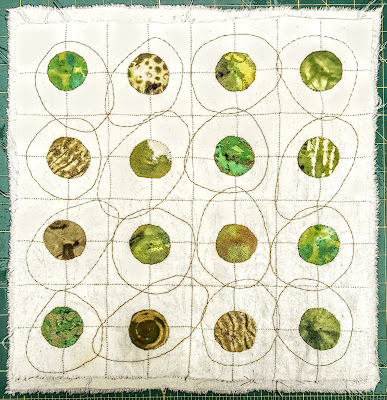 The nine-patches are tiny, about 3-1/2 inches square. I had satin stitched areas on three of the squares, but subsequently didn't like where it was going. So I ripped all that out last night. I've got something else in mind that I know I'll like better. Any red threads you see are temporary basting stitches. I'm just finishing up a really terrific book, Soul of an Octopus by Sy Montgomery. Now I'm keen on cephalopods. We're having another rainstorm on the North Coast. And it looks like we might have some rain for at least the next 10 days or so. Could be we're in for a wet winter. Wouldn't that be lovely! Unfortunately, I don't think Southern California is due to get much if any rain, not in the immediate future anyway. Hope you have a really great week! Several days hence...and this is Hunter's Moon, in honor of the Hunter's Moon we're said to be having now. Living as close to the coast as I do, invariably the nighttime sky is clouded over, hence I never get to see sky events ~ meteor showers, full moons, eclipses when they're visible in the Pacific Northwest. Oh well. Making this piece that I really love has done a lot to build my confidence. I spent all day yesterday working on it and enjoyed every minute of it. One of the difficulties I've had in my artistic endeavors has been in trying to be too literal ~ the reverse of which could be summed up as not realizing I have an imagination I can put to use, if I'd only exercise it. So I tend to be thrown to trying to replicate reality in some way, rather than fiddling around with elements regardless of whether the product might be wacky and unreal. Who cares whether it's "real" or not? Nobody. As Jude said in a comment to my last post, it's enough to just enjoy it. Working on SunMoonStars now. The first start didn't work for me, so I dismantled the column of five 3-inch squares into singles. I'll use them elsewhere, quite possibly in something for this series. But for now, I'm cobbling together bases on which to do further work, using scraps and odd bits as well as already-cut squares. I'm not sure why it's being so difficult for me to just let go and stitch ~ stitch things together randomly, embroider with abandon, think outside the box, push the envelope. I had the same kind of difficulty with painting. A held-backness. Things always appear to be easy when someone else does them, yet I struggle to just dive in. This has kind of been a lifelong thing for me, a certain feeling of constraint. I'm having a memory right now of when I was quite small, of coloring in coloring books. My M.O. was always to heavily darken the lines with a colored crayon, and then fluidly fill in the space. That says something to me about making sure my boundaries are secure before allowing myself to expand into the conscribed space. I'd never let myself color outside the lines ~ that was a no-no. I realize that I obviously didn't arrive at that all by myself when I was a kid, that I was responding to the messages I got from my environment. Maybe I can sum up my life as being my best efforts to go outside the lines. And although I've managed to do that in many and likely most aspects of my life, in my art, I've had far more difficulty stepping out. So this isn't a new place where I find myself at the moment. At the risk of sounding defeatist, which I'm not really...perhaps I've hit my limit, an edge that I may or may not be able to go beyond. I always like to think that I can go beyond, certainly always that I should. But I don't know. I might just be who I am (well of course I'm that! ), have the level of talent or skill that I have, and this is what it is. This is the little piece I've been working on. I finished it a couple days ago. I'm calling it Other Worlds. It's 12 x 12 inches square. The big dots are a variety of handmade fabrics. So now I'm gravitating to doing some stitching along the lines of Jude's Sun-Moon-Stars theme. I've got fabrics set aside and hope to dive in the next day or two.